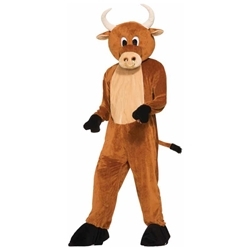 Bull Deluxe Adult Costume. Includes a headpiece with see through mesh eye openings and jumpsuit with attached mitts and shoe covers. Fits size 40-42.